By looking back the heroes in movies and videogames back then, it seems the ninjas were very fashionable in the late eighties, and that's in this context that Tecmo's Ninja Gaiden makes some noise in the arcades, and is then successfully adapted on many home systems. 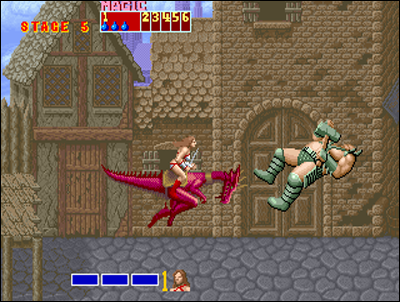 Unlike the three previous titles, this game uses modern gameplay like Renegade and Double Dragon, with moves in three dimensions. 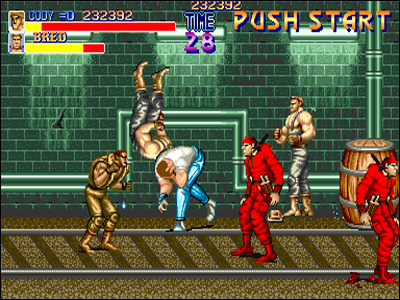 The gameplay of this Ninja Gaiden is varied, interesting, moves and attacks are numerous, and strategic opportunities greater than other competitors using a single plane. Interaction with the background objects, platforms, weapons, jumps, varied action... An interesting alternative to Double Dragon that will be remembered. The genre declined as Ninja Warriors, Bad Dudes or Vigilante - playing on a single line- evolves to a sort of action-platformer kind (Shinobi, Ken-Go, Magician Lord, Castlevania...). SNK finally unleash the power with Prisoners of War. In a totally Ramboesque register, the soft takes back many of Renegade's gameplay principles, packing a cooperative play in addition. 3D gameplay, two-players game, weapons to pick up (even guns! ), interactions with the sets, not to mention a top realization. An excellent title of the firm, which will encounter some success in the arcades. But the competition is coming to a certain level, as editors have realized how this fighting game market gonna be juicy. 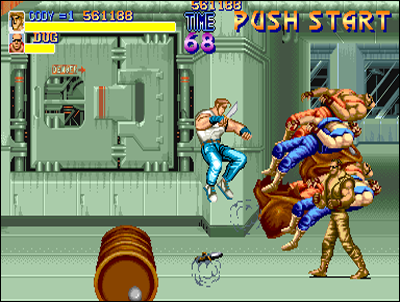 Prisoners of War is SNK's first Beat'. The same year comes Double Dragon II, which strangely went relatively unnoticed. 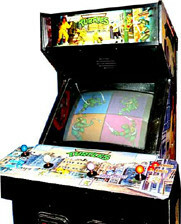 The game didn't made too much money in the arcades. 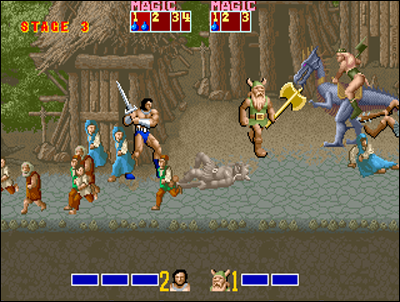 The graphics are a hardly better than in the first game, but the levels are varied and range of moves a little wider. Unfortunately, the controls are ugly, slowdowns even more present, and the difficulty is especially insane. These quite unforgivable defects will clearly disappoint the fans of the first game, who we able anyway to choose among several better games than this one by those times. Double Dragon II, a real flop. 1989 is coming, and it's going to be a year to mark a milestone for the Beat'. The NES is spoiled with River City Ransom from Technos, which makes with this game a Double Dragon clone with its own personality and its own new characters. Konami is back in the competition with a title that rises the level: Teenage Mutant Hero Turtles is using the Ninja Turtles license. The title comes to be very successful. We fight with weapons, the game is playable four simultaneously, an packs a comprehensive gameplay... it's another title that'll be remembered. This encounters such a success, that it's adapted on a lot of consoles (with the NES again, now perfectly supplied with Beat them Up). 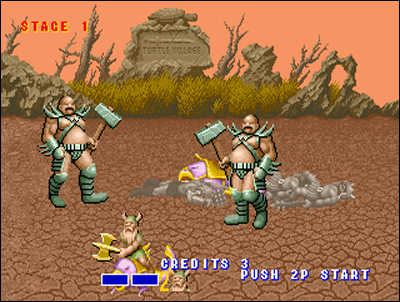 Four players can also enjoy Crime Fighters sensations the same year, despite low quality graphics and quite small sprites. Konami comes back under the spotlights, with TMNT and Crime Fighters. 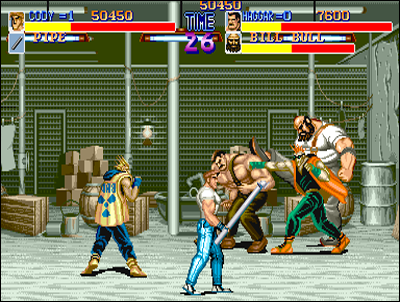 Alpha Denshi / SNK is still in the game, with Gang Wars, an excellent title walking in Double Dragon's path (oh, that's so original!). Providing a good level of realization and a well thought -gameplay- quite new for a BTU, featuring evolutive characters, the game spreads around the world. But all this is not really impressive compared to the biggest Sega release that year. 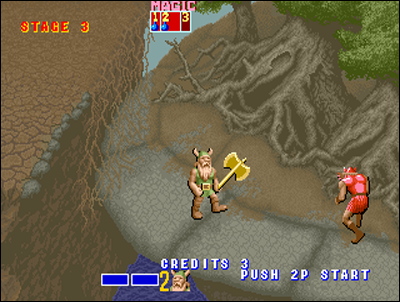 The editor remained on the reserve since its modest My Hero, and now he is back with his new hit, Golden Axe. Beat' is seen here declined heroic-fantasy sauce, and it enthusiasm crowds. Three selectable characters, varied action and thrilling storyline, and a nice course quite taking ... The game is full of qualities and beautifully renews the genre, to the point that Capcom will inspire strongly from it for its King of Dragons (and some others) a few years later. 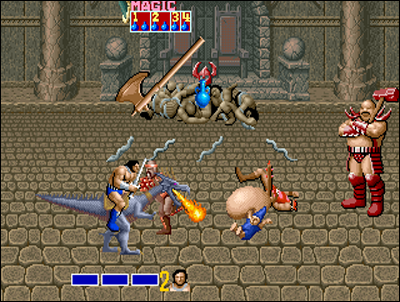 The game will be ported to Sega Genesis and will boost considerably sales of the system. 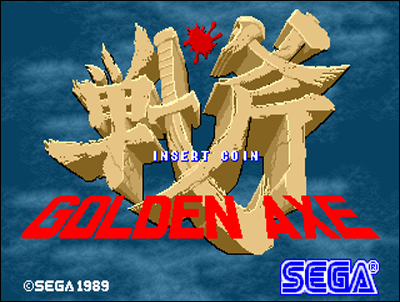 Sega's Golden Axe, a big reference. 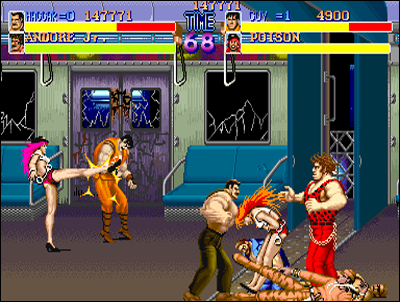 Capcom's Final Fight is finally released fall December 1989... and what a slap, my friends! It's simple, technically, the game eclipses everything we have seen so far. The CPS (Capcom Play System) impresses with its power. Sublime graphics, huge sprites, fluid and detailed animation... 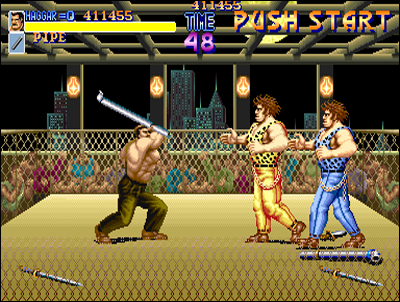 The sound effects and music are excellent too, as the game is full of vocal digits and good punching sounds. 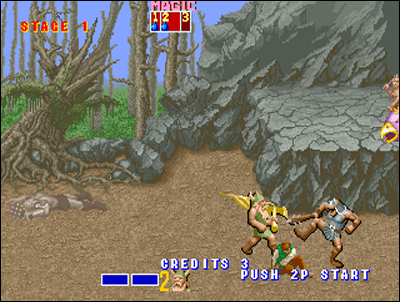 Technological showcase for Capcom, the game is no less a model of gameplay: three selectable characters, game playable two simultaneously, weapons, varied moves, bonus stages, long levels and addictive play... This Final Fight is a blast! 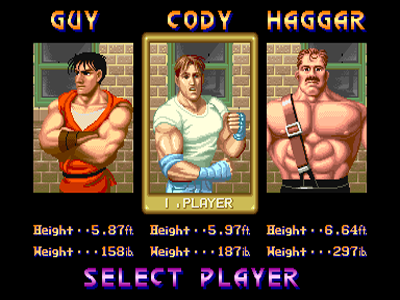 It immediatly stands as the reference of its kind, and if Double Dragon had paved the way, Capcom impose through this game the modern standards Beat them Up for years to come. A title that have often been copied and rarely equaled, as we shall see! 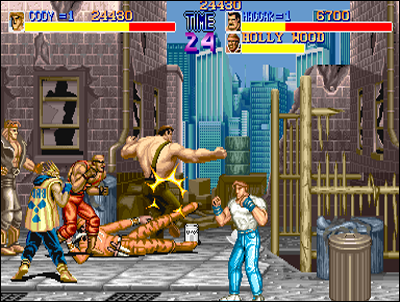 Final Fight becomes Beat them Up's new benchmark. 1990 points the tip of his nose. 16-bit machines are installed on the market, and the competition's gonna be tough: the Super NES hits the market fall 91 and the war Sega / Nintendo is starting. The 2D arcade will have its best years: SNK Neo Geo system is created, with the Neo Geo AES on the home consoles market and as the MVS as an arcade system. This will trigger a battle between the two giants Capcom and SNK. Quality war will begin between all major arcade editors in the wake of these ones... and for sure, the winners will be the players! The very best Beat em Up games will emerge during the next years.